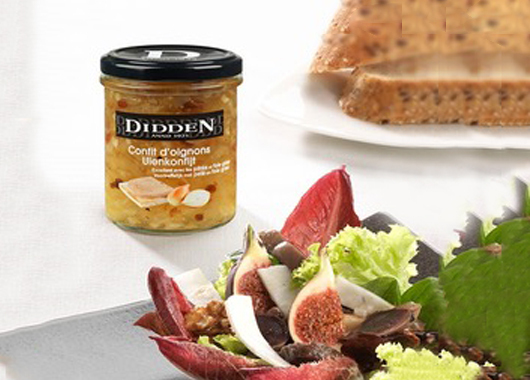 In 1925, Jean-François Didden began making his own mustard. On the strength of this success, he then set up “Didden & Fils – Usines Didden” together with his two sons François and Théodore. The company branched out into the production of vinegar, gherkins, onions and piccalilli. In 1939, François Didden died. The third generation took over just after the war: Pierre Didden and Jacques-Emile Pany had a passion for taste and sound business sense. Between 1950 and 1980, they worked to increase the influence of the Didden brand. The launched a range of mayonnaises and cold sauces. At the end of the 1980s, they entered the private label market and launched the company’s famous chutneys. In the mid-1980s, their children, Michèle Didden and Jacques Pany, joined the company, which they managed from 1996. Since 2006, Michèle Didden has been the sole manager and shareholder of the company. Didden still has the same friendly atmosphere. This family company has chosen the path of growth and modernity, while maintaining the authentic nature of its products. Didden follows market trends and launched ready-made cooking sauces, Italian sauces and an ever increasing range of chutneys. The quality of its products is supporting Didden’s international expansion. Its range can be found in France, the Netherlands, Luxembourg, Norway, Sweden and Denmark, Estonia, Lithuania, Germany, Finland. The Anchor Group will assist Didden Food in expanding in Europe and Asia.